Home / Blog / Grammar Question: Can “They” or “Their” Be Singular? My brother Craig wrote me with a grammar question, and since it’s a common one, I thought I’d share it and my answer. Thanks, Craig, for giving me today’s post idea. Two birds with one stone. The story is written from the perspective of a stainless steel water bottle, and the they is the person whose hands it winds up in. What’s your take? Can’t the they also refer to a single person in this instance? Good question. Not an easy answer. First, who can be singular or plural: “Who ate my cookie?” or “The people who love me the most…” In this context, however, who is clearly referring to a single person. Nothing ambiguous there–definitely singular. 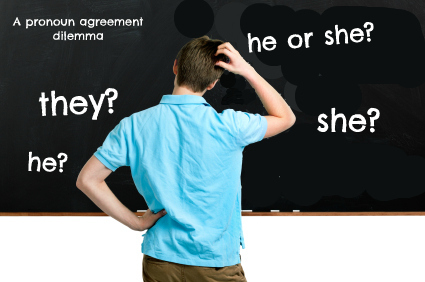 Traditionally, pronouns have been expected to agree in number with their antecedents–the words they take the place of. Many teachers insist on this in every instance. That means that the pronoun used in place of whose should be singular here. The problem is, we don’t have a gender-neutral singular possessive pronoun to agree with whose. We’ve got he or she. But it’s not possible to identify the gender of the antecedent who, so which is right? The convention for most of English history has been to default to the masculine when there is a question of gender. So, the simple solution would be to say, “Would he take my message seriously?” That’s what Strunk and White would recommend. Largely due to the influence of feminism, modern linguists began questioning this convention. They didn’t see why the default should always be to the masculine. Isn’t that chauvinistic? Fair enough. But what’s the solution? Most settled on he or she as an acceptable alternative in such instances. (“Would he or she take my message seriously?”) But writers hate that solution because it’s long and clunky. Others suggest alternating randomly between the masculine and feminine–use he sometimes and she others. Well, that pretty much just confuses people because they don’t recognize either as gender-neutral. Readers, especially those who are familiar with English conventions, get distracted by the use of the feminine when the gender of the antecedent is unknown. Among linguists and educators, the debate still rages, but ordinary English speakers seem to have settled the matter for themselves. Almost every American simply uses the plural (and gender-neutral) pronoun like Molly does in her sentence. No one says “Who left his hat on the sofa?” They say “Who left their hat on the sofa?” Well, no one except crotchety English teachers maybe. Grammar sticklers hate this (like the teacher who corrected Molly’s paper, although she was nice about it and at least used the terms “tradition/convention” instead of “correct.” ), but unless we invent a new gender-neutral, singular pronoun, I can’t think of a better solution. As always, this issue comes down to the looming question: who decides what is “correct” grammar? Most of us look to style guides and dictionaries and all of them are moving toward acknowledging the common “singular they” solution. They all recognize that the ultimate authority is predominant popular usage. If people keep saying it one way, eventually it has to be recognized as an acceptable way to say it. By the way, I’m glad the teacher didn’t also correct her for ending the first sentence with a preposition. Any thoughts? Does this stuff confuse you? Drive you nuts? Here’s your chance to get it off your chest! Leave your comments below. Do Students in Online Classes Cheat More? Great, Rhonda. Keeping the antecedent plural is often an easy way to avoid the problem. Right, Brian, I agree with your suggestion to revise the sentence if possible. Or avoid the problem altogether. . . which is why I advise my WriteAtHome students to try and stay plural.